This is a great quick way to start your math class. It is a math warm-up that is sure to get your students’ math brains working. 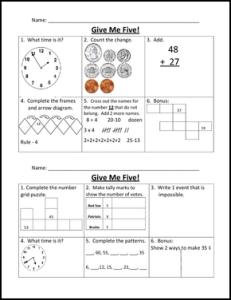 There are several different Give Me 5 worksheets. Check them all out. ← St. Patrick’s Day: Motivating students to reading for meaning ~ with humor!